Relax and enjoy your own private spa in the center of The Village. This beautiful 2-bedroom, 2-bathroom condo in Grand Sierra Lodge (premier building in The Village) is completely remodeled with over $50,000 in upgrades...nothing else in The Village compares. We recently installed triple pain sound proof windows, new carpet, and paint. The master bathroom has a 4' x 10' custom built steam-room / with 8 shower heads including 2 rain showers and 6 wall sprays, built in Bose speakers, all controlled from a digital panel allowing you to adjust temperature to the exact degree you desire. The bench for two folds flush to the wall making ample room for yoga matt, with all lighting on dimmers it's the perfect zen retreat in the mountains...a great way to start and end your day. Master bedroom has an amazingly comfortable Sterns & Foster Cal King mattress, full body message chair as well as desk with high-speed internet and printer/scanner so you can unwind and get work done when necessary. The guest room includes new, customer built twin xl over queen bunk bed with memory foam mattresses and TV. The kitchen offers a custom bar with seating for four, while the living room has an HD plasma TV with Polk audio surround sound, a sectional couch (be careful once you sit down you may never get up), original artwork and paintings, as well as new custom lighting throughout the unit. The patio comes complete with custom slate, a table for two and a BBQ. 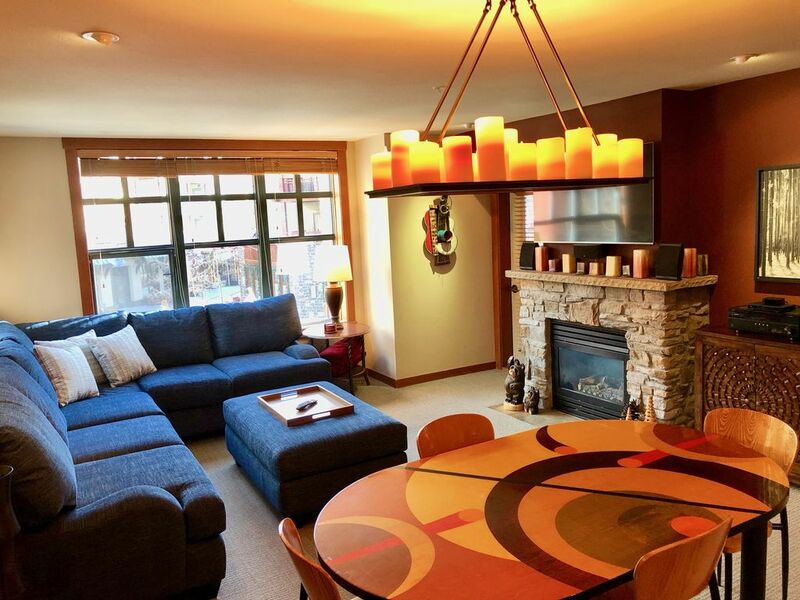 The condo is located just around the corner from the front desk making easy access to and from main village walkways and no need to wait for elevators. Also very help for loading and unloading of your car. The best location in town, steps to the gondola, shops, restaurants, and bars. Building offers heated pool, several hot tubs, workout room, game room and media room. Unit comes with one underground parking space, additional parking is outside if needed. Quick easy access to everything makes this the idea location for friends and families to vacation. Once you arrive there is no need to drive drive anywhere. Most bars and restaurants are within a few hundred yards from your door and there are bus stops in front if you need to go anywhere else in town. You have full access to all amenities, including a laundry room, a game room for the kids, and the kitchen comes fully stocked with everything from a coffee maker to a crock pot. I live at the beach in San Diego and split time between Mammoth and Mission Beach. I'm a private pilot so getting back and forth isn't so bad. We enjoy adventure travel so if I don't get back to you for a fews days it's most like because I'm on a trek in the middle who knows where. We love The Village and can't say enough good things about it, be it summer or winter all the things we love to do are literally right outside the front door. Since purchased new in 2005 I've have completely remodeled the condo to make it my home. It's never been in the rental pool and I'm very particular about who I will rent to. Some of my favorite paintings are hung throughout, new furniture, 55' HDTV, my dream shower (all I can say is you have never seen anything like it), amazing massage chair, as well as a desk with wireless internet and printer. There is nothing else in The Village like it. Each of the 3 buildings in The Village have their own fitness center and hot tub. You have access to all, the one closest is the largest / nicest. The building contains a game room with traditional arcade games and 3 Playstation 3 areas. There are two hot tubs by the pool, two more in Lincoln House, and one in White Mountain Lodge. Great condo in a perfect location! What an awesome rental. House looks exactly like the photos and everything works great. Brad was a great host who responded to all my texts within minutes. We had a great experience at this condo. Everything is as described. Will stay here again. The condo was clean and had all the cookware needed to eat dinner at home. There were plenty of towels and bedding. I would highly recommend this condo to future guests. The Village never disappoints. Loved our property and owner is very receptive and accommodating. Condo was great! Clean and in a great location! We had a GREAT stay! The place was amazing and would book it in a heartbeat. Very clean and the shower and location was great. The only issue we had was that The Village staff was not friendly in any way to us because we were VRBO renters. Such a shame as I’ve been booking though them for over 10 years. Thank you to the owner for immediately helping us with the situation. I'm glad you enjoyed your stay...unfortunately the staff gives mixed results, more often then not they are great but sometimes not so much. They do pay attention to comments such as this so it helps.